Prior to settling in Lakewood, Rav Dershowitz served as the Chief Rabbi of Newport News, VA as well as various cites across Wisconsin. The Rav was widely known for the many weekly shuirem (lectures) he delivered. הוא כנראה דודו של ר’ יקותיאל דרשוביץ מבני ברק, מההכשר של שארית ישראל לשעבר. ר’ יקותיאל מבני ברק, הוא בן של ר’ יצחק. על ר’ יצחק דרשוביץ, היה כתבה ביתד נאמן במוסף שבת קודש, לפני כמה שבועות. 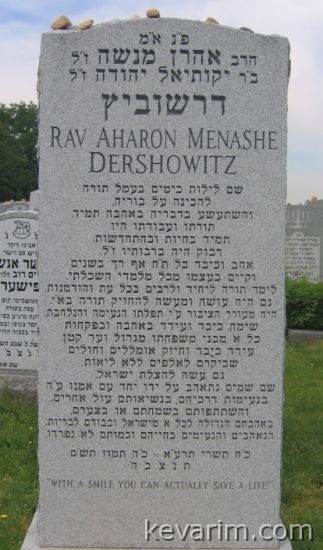 I assume he is the father of Yitzchok Dershowitz who wrote that historical novel on R Aron Kotler. Also, uncle of Alan Dershowitz, esq. from Harvard. Yes. he is Reb Yitzchak’s father. I am trying to contact a Rabbi Dershowitz from Lakewood who married my mother to Max Komito (from Lakewood) about 25 years ago in lakewood. It was about 1985 or 1986. We are looking fors ome type of a katubah etc. Thank you.